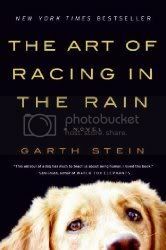 In The Art of Racing in the Rain, Garth Stein takes us on the amazing life's journey of an equally amazing hero, Enzo. Enzo is a dog, and he tells The Art of Racing in the Rain, describing his life from his early years with Denny to his adjustment to family life when Denny marries Eve and they have a daughter, Zoë, through Eve's passing and his final years with Denny and Zoë. The story is so much more involved that this simple synopsis, though. We experience all of Enzo's emotions; his thrills with riding in a race car with Denny, his growing love of the family that he perceives was forced upon him, his struggle to understand the human side of things so that he can be a better dog. Ultimately, the story is about a dog and his love for his human, and how he will do whatever he needs to do for his human to be happy. Even though Enzo is a dog, quite frequently he comes through as the most human character in the story. His insights into human behavior and his own response to that behavior is a beautiful thing to watch unfold. He would have a lot to say about the human nature of others, but since he is a dog, he cannot speak. His inability to speak, however, gives him an opportunity to observe what is going on around him, and over his lifetime he gains an exceptional understanding into life and the nature of people. That, and his hours of being able to watch TV when no one is home. There are so many times in the story where Enzo's thrill just to be alive practically leaps off the page. Not everything that happens in his life is as it should be; just like in real life, there are happier times and not so happier times, but it is how Enzo works his way through the problems and adapts and grows, making sure his is always there to do what Denny needs that really shows his love for his human. You cannot talk about this book without discussing the other aspect of Denny's life, racing. Denny has the ability to become a world famous race car driver, but one setback after another prohibits him from ever fully realizing his dream. The title of the book comes from Denny's love of driving, and the theme of racing and driving are prevalent throughout the book, almost becoming a metaphor for the way to react to situations the characters find themselves in. If you see this book on the shelf and are questioning it, don't hesitate to pick it up. Find a comfortable place and immerse yourself in the story. Just make sure that you have tissues at hand. Enzo's story is not always one of pure happiness, but it is one of pure love; the love that he has for Denny and that Denny has for him. Stein has created an amazing story for dog-lovers everywhere, and even if you aren't a dog person, you'll still find yourself cheering for Enzo and his adventures. "Anne Rice returns to the mesmerizing storytelling that has captivated readers for more than three decades in a tale of unceasing suspense set in time past—a metaphysical thriller about angels and assassins. Into O’Dare’s nightmarish world of lone and lethal missions comes a mysterious stranger, a seraph, who offers him a chance to save rather than destroy lives. O’Dare, who long ago dreamt of being a priest but instead came to embody danger and violence, seizes his chance. Now he is carried back through the ages to thirteenth-century England, to dark realms where accusations of ritual murder have been made against Jews, where children suddenly die or disappear . . . In this primitive setting, O’Dare begins his perilous quest for salvation, a journey of danger and flight, loyalty and betrayal, selflessness and love." Angel Time will be released on October 27, 2009 from Knopf.